The Blakes Come to Melling, by Margaret Biggs | So This is School! ‘Hello, Helen,’ said Rona, smiling at the newcomer. So that clinched the matter. This was the girl whom Libby intended to detest, come wind, come weather. 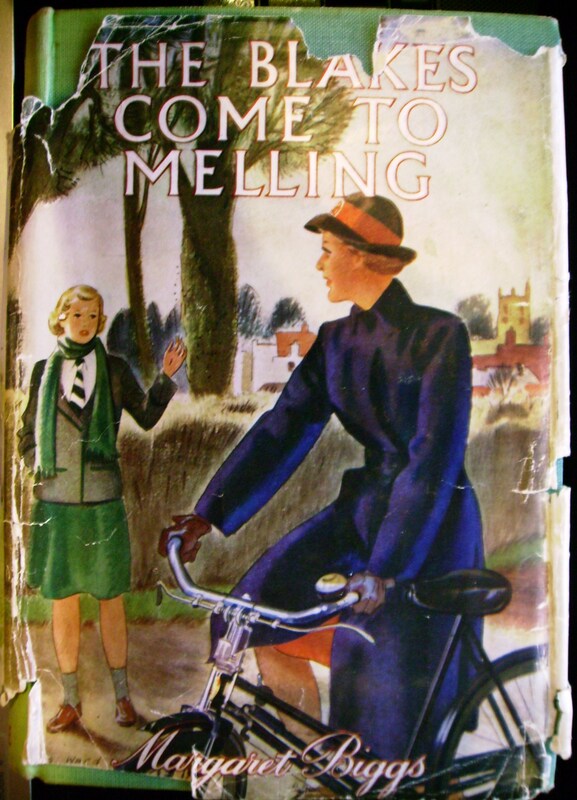 The Blakes Come to Melling was published in 1951, when the Girls’ Own genre had long passed its heyday. By the end of the fifties, publishers were refusing school stories from all but the most popular of authors. Society was changing, the genre had never been looked on with favour by critics, schools or parents, and the stories themselves were becoming old hat. Margaret Biggs, however, is a writer who has the skill to bring true freshness and originality to a well-worn genre. The Blakes Come to Melling is, on the face of it, not an original story. The proud Laceys, forced to sell their old family home, Bramberley House, are determined to have nothing to do with the new owners, the happy-go-lucky Blakes, and the book charts the families’ changing relationships among themselves and with one another. Margaret Biggs’ skill lies instead in her portrayal of the characters, from the vague but sweet headmistress, Miss Pickering, to reserved, chilling Libby Lacey, and in her creation of the atmosphere of a small private boarding school. For me, it’s really the characters who make the book outstanding. Mrs. Blake, a placid but vastly intelligent writer of academic tomes, regards twelve year old Susan’s suspension from school as a nice, restful holiday and Mr. Blake, who earns ten times as much money with his trashy but bestselling detective novels, is little better. In fact, the only Blake who is really concerned about Susan’s behaviour (which can be fairly outrageous) is Roddy, incidentally also my favourite of the family. This is partly because of her love of books, which leads her to reorganise the entire library in her spare time, but mostly because although she’s very quiet and intelligent and quite reserved, she doesn’t hesitate to do what she believes is right, whether that involves telling Susan off for the good of her soul or inking the skirts of two obnoxious prefects in retaliation for their unkindness to her older sister, Helen. While the Blakes are hilarious and loveable, it’s really the family dynamics of the Laceys that keep the plot moving and the book interesting. At the centre is Libby, bitter and miserable because the Blakes are living in her old family home, her attitude fostered by her rigid mother, who is so proud and reserved that she rarely shows affection even to her own daughters. The result is that twelve year old Laura is painfully torn between her wish to please her mother and sister and her desperate desire for the warmth and affection that the Blakes give her, and which she can’t get from her own family. Margaret Biggs’ second great strength is her realism. This may sound strange in a review of a book that’s part of a genre not generally noted for its realism, but Margaret Biggs has a firm grasp of authentic human behaviour. None of the characters is wholly good or wholly bad. Libby doesn’t have a blinding revelation; Laura doesn’t suddenly start standing up for herself; only Mrs Lacey experiences anything like an instantaneous turnaround, which is understandable since it’s her daughter who’s been lost for hours on a snowy winter night and Mrs Lacey, quite rightly, blames herself. I didn’t come to Margaret Biggs until I had been collecting Girls’ Own books for a few years, but I knew immediately that she was going to become a favourite. Her plots might not be sensational; her characters are not inspiringly good or horrifyingly bad; there are no terrifying accidents or life-threatening freaks of weather. No one achieves magnificent heights of academic or creative fame, nor are there villains who are chased away with their tails between their legs. It’s just a simple story of ordinary people; the magic is that when we are reading about them, we cannot help but care about them. This looks fab, will have to try and get hold of some Margaret Biggs books! Great review, thanks.